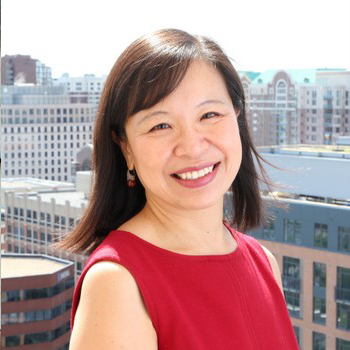 Sindy Yeh is the Senior Business Ambassador for Arlington Economic Development. She brings to her position more than 20 years of experience in business development and program management. In her current role, she assists Arlington companies to expand and/or relocate in the community in an effort to grow the economy of Arlington, Virginia. She is a Certified Economic Developer. Prior to joining Arlington Economic Development, Sindy was employed in the telecommunications industry concentrating on international business development and licensing. She has worked for Iridium, an international satellite telecommunications consortium, as well as the fixed wireless company, Teligent. Sindy utilizes this experience in her current position, encouraging domestic and international companies to locate in Arlington, and working to retain those companies already doing business in the County. Sindy has a B.A. in Economics and Music from Wellesley College in Wellesley, Massachusetts; and a M.A. from the Johns Hopkins School of Advanced International Studies in Washington DC. She serves on the board of the Washington Network Group and the Northern Virginia Technology Council (International Committee); and is a member of International Economic Development Council (Education and Certification Committee) and the Virginia Economic Development Association.